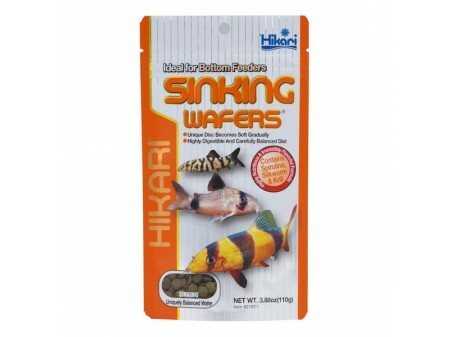 Hikari Tropical Sinking Wafers are a scientific diet for Catfish Loaches and other bottom feeders. - The unique "soft wafer" is developed for bottom feeders who have small downward facing mouths and must gulp their food. - This extremely flavourful diet offers premium-grade fish meal silkworm and krill meal with superb nutrient balance. - Perfect for smaller aquariums or to target feed multiple areas of larger tanks thus avoiding competition for food. - A highly digestible scientifically developed ingredient profile to help most bottom feeders develop their full potential. - Contains stabilized vitamin C which supports a healthy immune system. - Loaded with pure-cultured spirulina to help your underwater friends look their best.